Prevent unauthorized access to sensitive areas with high performance padlocks. Non-conductive nylon padlock is designed with lightweight and anti-spark properties, and features unique key cylinders that blocks electricity from being transmitted from shackle to key. 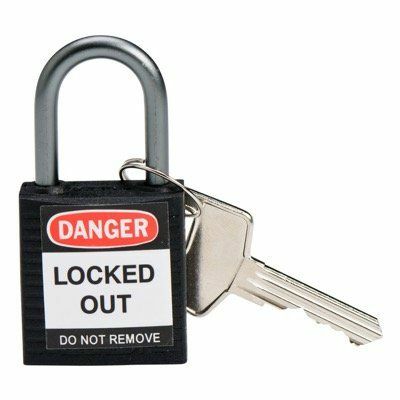 Non-conductive Brady padlock resists corrosion and chemicals, and is a perfect alternative solution to metal locks for electrical lockout procedures. Special feature requires closing of padlock shackle first before finally releasing the key for added security. 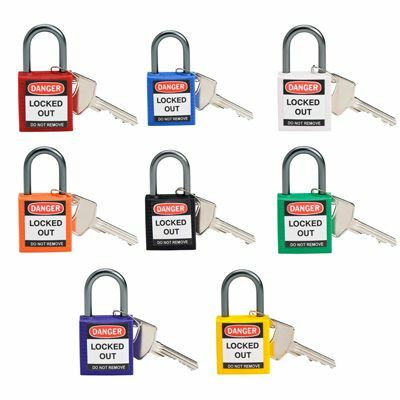 Brady safety padlock is available in different color options, and comes with (1) padlock, (1) English/French label, (1) English/Spanish label and (1) key. Also available in packs of 3 and 6 padlocks.